Photo by James Leder taken during the 2014 “Our Shared Responsibility–the Land, the Waters, the People” Totem Pole journey from South Dakota to the Salish Sea, which concluded in Alberta, Canada. The photo was taken in Seattle as the Totem Pole was on its way north. The journey was to demonstrate a shared responsibility for the lands, the waters and the peoples who face environmental and cultural devastation from coal and oil megaprojects. 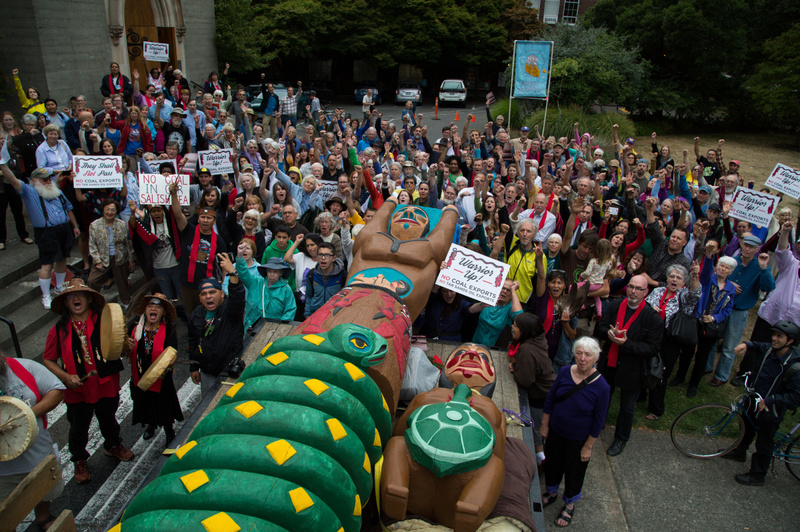 The 19-foot-tall Totem Pole was carved by Lummi elder and Master Carver Jewell James, who said a primary goal of the journey was to connect tribal nations along the coal corridor. Idle No More rally in defense of sovereignty, protesting the April 6, 2013 CERA/CERF conference at the Lakeway Inn in Bellingham, WA. Screen shot of YouTube video of the gathering. 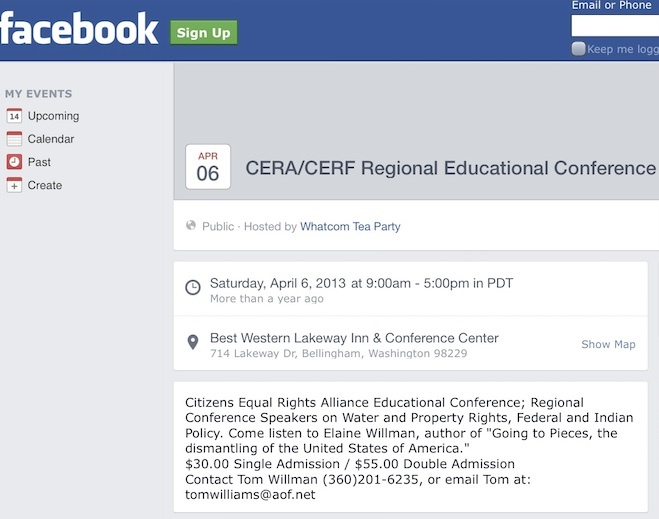 You let CERA board member, Minuteman militia member, and anti-Indian conference organizer Tom Williams off lightly. In 2005, Williams and his group of armed vigilantes were part of the national anti-immigrant campaign, exposed in the Public Good Project special report Racist Origins of Border Militias. but I’m sure they don’t represent the vast majority of PNW citizens who reject the out-and-out racism of the station and its mouthpieces. Thanks for a great overview of the most disgusting form of Capitalism in practice – the Profits of Racial Scapegoating. I love the CERA conference presenters list. Describing Marlene Dawson as a “pro se Attorney” and Skip Richards as a “paralegal” is hilarious. Neither has any legitimate credentials in the practice of law, but both have two decades experience promoting hate and encouraging racist violence toward Lummi Nation. September 2015 is the 20th anniversary of KGMI talk show host Jeff Kent leading Fee Land Owners Association representatives Jeff McKay and Linnea Smith in an hour-long diatribe against Lummi Nation for protecting its water resources on the Lummi Indian Reservation. Kent’s program was terminated by KGMI in response to public outcry. Where’s the public outcry to terminate Halterman’s show? Your note that the trail from CERA to SAVEWhatcom is “foggy in nature” could be misunderstood. 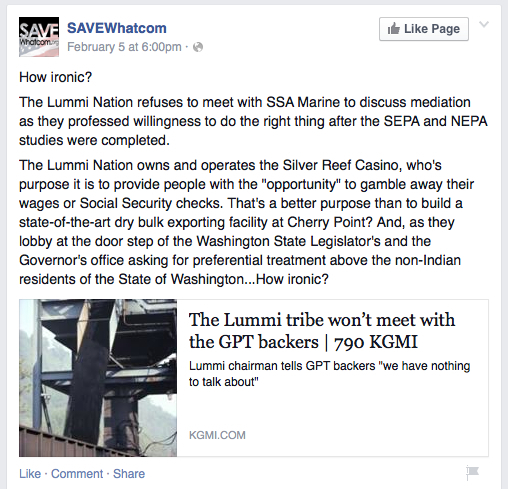 The working relationship between Whatcom Tea Party (WTP), KGMI and CERA is crystal clear; SAVEWhatcom (SW) is an offshoot of that relationship. CERA publicly instructed WTP to seek GPT funding, which emerged as SW. The foggy areas are the private discussions between SW, WTP and GPT from April to August, 2013. After paying an out-of-court settlement for illegally bulldozing the Lummi burial ground at Cherry Point, Watters’ remarks about protecting tribal cultural sites on its private property exhibit astounding hubris and dishonesty. His feigned concern for Lummi fishers, suggesting GPT jobs will help get them off federal grants and subsidies, is not so different from other racists clamoring for an end to welfare. Insinuating that Indians receive “preferential treatment” is part of the CERA strategy, ignoring the fact that it was the violation of treaties by the U.S. Government that led to Indian gaming as a compensatory consolation prize. While it is true that Indian tribes receive federal grants and subsidies, as do all 50 states and many corporations, it is far less than what is due them in terms of the value of stolen reservation lands and resource royalties, as well as failure to enforce U.S. trust responsibilities to protect treaty resources. That failure, along with diminishing federal support to tribes, means that federal subsidies and grants do little more than partially replace reductions in federal budgets for treaty obligations like health and education. Tribes that step up to protect their treaty rights and resources are simply doing what the U.S. has failed to do, despite all the lofty promises to tribes. Jay T: Thank you for all the additional information. I wish I could have included much more than I did, but then the article would be even longer than it already is. There was more information that I would have liked to have added. What I found interesting in researching information about the KGMI radio shows for my article, was that Whatcom Tea Party board member Kris Halterman began hosting the SML radio show in 2012. That timing lines up well with the timing for the proposed GPT permit application process and the EIS scoping in 2012. On the SML radio shows, there was a great deal of focus on GPT with frequent shows, many of which were devoted to that subject, or were on issues relating to GPT. A similar pattern was also evident throughout the SML blog posts starting in 2012 and continuing through the years following that. Leading into, and during the 2013 county council election season, GPT was even more frequently a topic for the radio shows and accompanying SML blog. 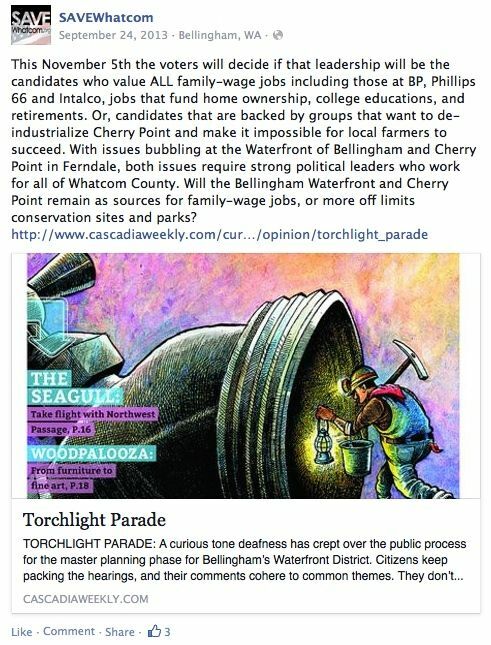 In looking at the KGMI radio shows, I also found that Ken Oplinger, who was one of the most vocal local (Whatcom) supporters of GPT, and a former co-chair of Northwest Jobs Alliance (created to promote GPT), hosted a radio show on KGMI called, The Whatcom Report. Oplinger was the former CEO of the Whatcom/Bellingham Chamber of Commerce and a former Blaine City Council member. He left Whatcom in June of 2013 for a new job with the Santa Barbara Chamber of Commerce, where among other things, he is applying his GPT advocacy experience as he is now advocating for oil/fracking as evidenced in numerous articles in that local area. The first show on the program list of The Whatcom Report (listed online) started in August of 2012 which was the month leading into the GPT scoping period for the EIS which started Sept. 24. Looking at the list, it seemed that the focus of many of those shows in 2012 was the proposed GPT and related subjects such as the No Coal initiative in Bellingham. 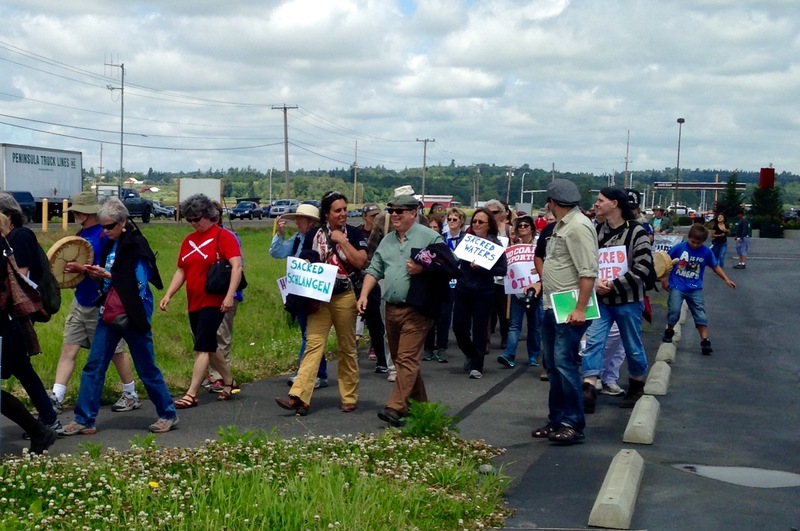 Certainly, the proposed GPT has received a great deal of advocacy coverage via some of KGMI’s talk radio shows. What I’d like to know is how did it come about that on Halterman’s, Donahue’s, and Oplinger’s shows, that these radio show hosts chose to focus such a sizable amount of airtime to advocate for that particular project? The Saturday Morning Live show has had an an emphasis on not only GPT, but also had numerous shows on issues closely related to that project such as regulations on businesses/industries, property rights (which pertains directly to regulations), water rights, and tribal issues relating to water rights—including issues relating to tribal sovereignty and treaty rights. Those shows centering on Native Americans were presented through the eyes of people such as CERA board members Elaine Willman and Tom Williams, along with Marlene Dawson, who work to undermine tribal treaty rights and tribal sovereignty, as they disseminate their views on these issues to the public—KGMI afforded them a platform to do that, via the radio.